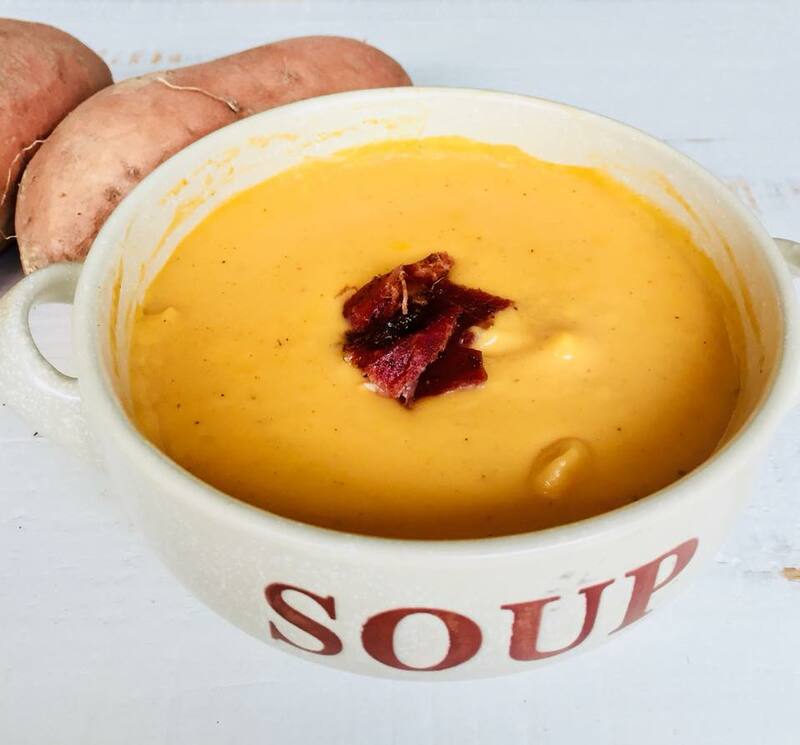 Creamy and delicious sweet potato soup with just enough sweet & heat. There is a soup that has been running around our family the last couple of years of which we can't get enough! It is a butternut squash soup that Ashton posted a while ago you can get to by clicking here . It has sweetness from the squash, creaminess from the cream cheese, and a little heat from cayenne. I'm not a soup guy in the least bit, but I L- O- V- E this soup and could seriously eat it whenever. The other great thing I love about the butternut squash recipe is its simplicity! It only takes a few minutes to prepare and not too many dishes. This soup is filling, creamy, and warming. It is the perfect soup for a winter night, but so good you'll want it in the heat of summer. Now that I've sold the butternut squash soup, what about this actual recipe? I went to the store a few days before Thanksgiving and saw sweet potatoes selling for crazy cheap. It instantly clicked in my head that maybe I could make our butternut squash soup and just substitute the squash with the sweet potatoes to add a more Thanksgivingy flavor. We did so and it turned out perfect. A little sweeter than the butternut squash and just as creamy and flavorful. This is the perfect recipe to add to a sweet potato recipe collection typically including baked sweet potatoes and sweet potato soufflé. To add a little more smokey, rich flavor, add my favorite bacon recipe you can find by clicking here . Enjoy! Note: the measurements in this recipe can be VERY approximate. Essentially, this is what you're looking for: enough sweet potato to fill a large soup pot when cubed, enough broth to cover the squash, and enough cream cheese to thicken it up. You can fine tune this recipe to your taste through a little trial and error testing. In a large soup pot, melt the butter and saute the onions until soft and translucent. Add the sweet potato and the chicken broth. Add more broth as needed to completely cover the potato pieces. Bring to a boil and then simmer until potatoes are very soft (approximately 15 minutes). Add the cream cheese, cover, and continue to simmer until cream cheese is mostly melted. Remove from heat and blend until completely smooth (read entire post for notes on blending techniques). Season with salt, pepper, and red cayenne pepper (use a light hand with cayenne until you know how spicy you will like it) to taste.